The resistance of a conductor changes when its temperature is changed. This property is used for measurement of temperature. The Resistance Thermometer Bridge Circuit uses the change in electrical resistance of conductor to determine the temperature. The change in resistance of material per unit change in temperature must be as large as possible. The resistance of the material must have a continuous and stable relationship with temperature. The main section of a Resistance Thermometer Bridge Circuit is its sensing element. The characteristics of the sensing element, determines the sensitivity and operating temperature range of the instrument. The sensing element may be any material that exhibits a relatively large resistance change with the change in temperature. The material used should also have a stable characteristics, that is, neither its resistance nor its temperature coefficient of resistance should undergo permanent change with use or age. It is necessary to consider stability in order to maintain the calibration of a resistance thermometer. The need for stability frequently limits the temperature range over which the sensing element may be used. Another desirable characteristics for a sensing element is a linear change in resistance with change in temperature. When the measured temperature is subjected to rapid variations, the speed with which a resistive element responds to changes in temperature is important. The smaller a given sensing element, less heat is required to raise its tempera­ture, the faster is its response. Platinum, Nickel and Copper are the metals most commonly used to measure temperature. The resistivity of platinum tends to increase less rapidly at higher temperatures than for other materials, hence it is a commonly used material for resistance thermometers. The temperature range over which Platinum has sta­bility is 260 °C-1100 °C. 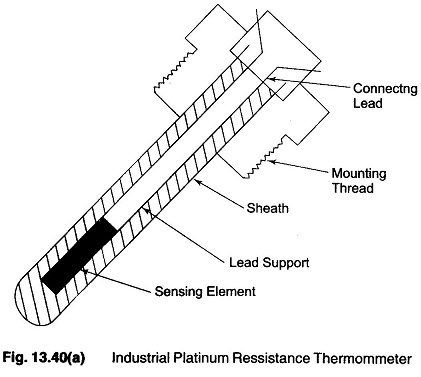 An industrial Platinum resistance thermometer is as shown in Fig.13.40 (a). The changes in resistance caused by changes in temperature as detected by a Wheatstone’s Bridge is shown in Fig.13.40(b). Hence, the temperature sensing element, which may be Nickel, Copper or Platinum contained in a bulb or well, along with the balancing bridge, forms the basic important components of a temperature measuring system based on this principle. The sensing element Rs is made of a material having a high temperature coefficient, R1, R2 and R5 are made of resistance that are practically constant under normal temperature changes. When the sensing element is very near the bridge, and under balance conditions, the following relationship holds good. In normal practice, the sensing element is away from the indicator and the bridge, and its leads have a resistance, say R3, R4. When resistance Rs changes, the bridge balance is upset and the galvanometer shows a deflection, which can be calibrated to give a suitable temperature scale. The measurement of temperature by the electrical resistance method has the following advantages and characteristics. The measurement is very accurate. Indicators, recorders and controllers can also be operated. More than one resistance element can be clubbed to the same indicating/ recording instrument. The temperature resistance element can be easily installed and replaced. The accuracy of the measuring circuit can be easily checked by substituting a standard resistor for the resistive element. Resistive elements can be used to measure differential temperature. They are best suited for remote sensing and indication. The response time of the resistive element is 2-10 s.
The size of the resistive element may be about 6-12 mm in diameter. No necessity of temperature compensation.